BMW Motorsport has secretly developed a number of one-off vehicles deep inside the bowels of Munich over the years. Some of these vehicles, from the ill-fated E34 convertible, E39 M5 touring and M8 have been exposed over time. Today BMW M unveiled their most recent and public one-off vehicle. 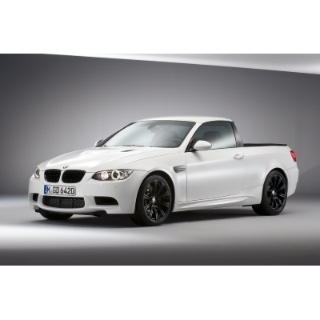 The BMW M3 pickup truck was finally revealed after months of candid spy photos have been distributed over the Internet. The one-off M3 has the same high-revving V8 as in the other three versions of the current M3, producing 420 hp. However, unlike the other three variants, the M3 pickup has a rear axle load capacity of 990 lbs. The roof of the M3 pickup is also unique in that it has a removable targa covering. Unfortunately, like all of the other secret one-off creations that have emerged from BMW’s motorsport division, the M3 pickup truck will once again recede into the secret storage rooms within BMW headquarters. I hear the same type of opinion from many other BMW M enthusiasts. This morning BMW released information that they had a fully developed BMW M6 CSL, but decided there was not a market for the vehicle and scrapped the project. It’s ironic because BMW made the one-off M5 CSL about one year back.